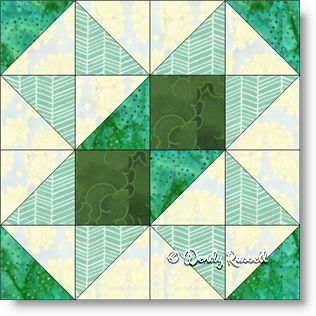 The Chisholm Trail quilt block is comprised solely of squares and half square triangles. Once again the value of the colour chosen is what sets the interest in this quilt block. This four patch design is made up of two different arrangements of patches to make up the four quadrants. The sample quilts shown use standard settings -- one, an on point setting with large setting triangles to give the impression of the blocks floating. The second quilt uses four blocks at a time, rotating each of them by 90 degrees, in order to take advantage of the directional nature of the block. This in turn, gives an entirely different effect.